There is a good bit of evidence that countries often do not benefit as much as you might expect from natural resources and that in some cases it might even make things worse. The first piece I wrote on this focused on the relationship between natural resources and civil conflict. This is by far my most cited piece of research but it is not especially original. The main contribution is I think the categorization of a multitude of logics through which resources might matter, many of which were somewhere in existing literatures. The empirical analyses are not strong on causal identification and many of the relations were surprisingly non-robust. Perhaps the most important claim was negative, that the evidence is just no there to support the particular interpretation that was gaining popularity at the time: that resources caused conflict because greedy rebels wanted to get their hands on them. Together with Joe Bell, Teresa Faria, Jeff Sachs, and Martin Sandbu, I worked on advising the government of Sao Tome on managing oil wealth. This required much more serious thinking about the political economy aspects of natural resources. Here is our "Model Oil Law " and some "Explanatory Notes." The model ended up influencing the law in Sao Tome quite a lot and elements of it were later picked up in other laws. Unfortunately for Sao Tome however the enormous oil wealth they were counting on did not materialize as expected. Martin and I also did some work on the issue of sovereign wealth funds. We argue that these as set up at the time did not place meaningful constraints on executives. 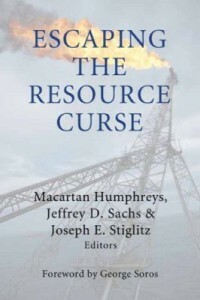 Together with Jeff Sachs and Joe Stiglitz we put a lot of the thinking going on at this time into an edited volume aimed as a resource for governments seeking to manage resource wealth well. The idea of the book is that there are things that governments can do that can work through various types of structural changes without having to rely solely on the willingness of leaders to do the right thing.